We(Senthil Kumar.P & Udhaya Kumar.V) visited to Baby Sarah’s Home, No.7, Rajaganapathi Nagar, Kakayanthope, Veerampatinam Via, Ariyankuppam, Pondicherry – 605 007. on 25-Jul-2009 & had discussion with G. Karthikeyan, Secretary. Last three years we are working with this home to provide education material and teachers. Mainly this home taking care of Mentally challenged children’s. 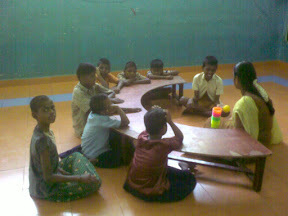 They have specialized teachers to teach basic things(daily activity) for this children. Based on the IQ level of these students, they are teaching some handicraft activity for this student. They need more volunteers/employees to manage mentally challenged children’s for around the clock. Currently they setup small computer center for normal students within home itself. Same as they build small play ground for all home students. 3. Babay Sarah’s School(Bharani Kalvi Nilayam): Three years back, one of the local person donate small school to this home & Pondicherry Heritage Round tables constructed school building at free of cost. Currently near village children’s studying in this school. 7. Teacher Salary per month : Rs.1500 to Rs.2000 p/m. 8.2.Required teacher for School(Bharani Kalvi Nilayam). 8.3.One library required for Home and School. 8.4.ABL material required for these school. 8.5.Knowledge on ABL method – This week end, G.Karthikeyan visiting to Mayanoor Gov School, Karur to understand ABL method. Our GUNASEKARAN.R(Action Board Member) & BALAMANIKANDAN.K (Trustee) providing basic session on this. Please let me know, if anybody wants to help to this home or school students. 8.5.Knowledge on ABL method – This week end, G.Karthikeyan visiting to Mayanoor Gov School, Karur to understand ABL method. Our GUNASEKARAN.R(Action Board Member) & BALAMANIKANDAN.K (Trustee) providing basic session on this. – DONE. and also they want Staioneries, Bags & Chappels for the school going children.